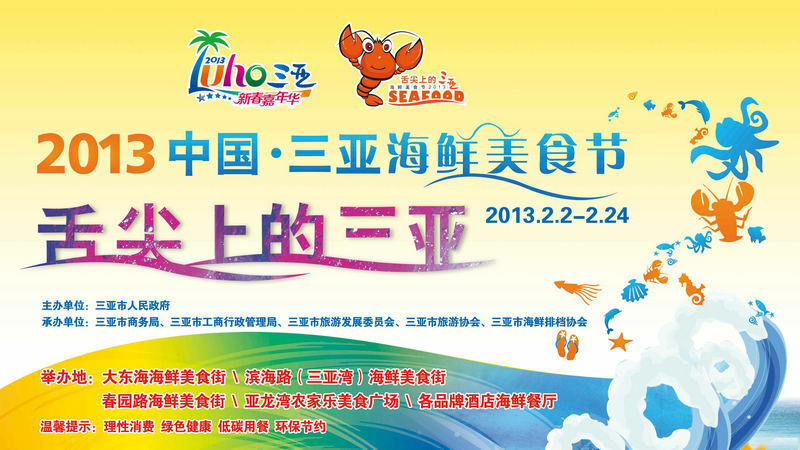 2013 Sanya Seafood Festival kicked off at Dadonghai Square on Feb 2 and will last until 24 for 22 days. The event consists of the opening ceremony at Dadonghai Square, Sanya seafood exhibition and sales promotions of about 150 local seafood restaurants and stores held in 7 seafood streets at Dadonghai Square, Binhai Road, Chunyuan Road, Yalong Bay Food Square and La Floret Plaza and the restaurants of 4-star and 5-star hotels in the city. At present, the Sanya seafood exhibition from February 2 to 5 is being held at Dadonghai Square, showcasing an extensive range of seafood and seafood dishes and residents and tourists can go to the site to get free coupons to sample seafood dishes. Meanwhile, the selection activity of Sanya Top Ten Seafood Restaurants from Jan.2 to Feb.6 is running. The final result will be selected through votes submitted by microbloggers and diners. These seafood restaurants are required to have fine dining environments and conditions, high quality food & beverage facilities and tools, and excellent service, and also need to have a good reputation for accreditation with reasonable prices. In addition, the free tasting activities for seafood lovers and seafood experts has started running from Jan.2 and will continue to Feb.23, and the event is publicized on microblogs and the Meishimeike Program of Sunny Radio to better promote Sanya seafood restaurants and seafood culture. To regulate the seafood market and improve catering services, 168 seafood restaurants in Sanya will install the price supervision system which consists of an electronic dish-ordering system, price publication screen and POS accounting system before the Spring Festival holidays.